Since 1985, we've made it our mission to help address the treatment needs and transform the sight of people across the globe. From the introduction of the first Ellex ophthalmic laser in 1987, through to our partnership with some of the world's leading names in ophthalmology through a number of Original Equipment Manufacturer (OEM) agreements since then, we have been committed to developing leading-edge ophthalmic laser technology solutions. Ellex has made a series of significant agreements over the years to accelerate our development. In 1992 the company implemented an OEM agreement with Alcon Laboratories Ltd to develop and supply the Alcon 3000LE laser system. In 1999, an OEM agreement was put in place with Coherent — now Lumenis — to develop and supply the Aura photodisruptor, and in 2001 Ellex established a second OEM agreement with Coherent to develop and supply the Selecta Duet™ SLT laser system for the treatment of glaucoma. The company undertook an extensive expansion of its own portfolio of Ellex branded products in 2006. This significant step was taken alongside an ongoing series of manufacturing, sales, and service investments that helped ensure our international capability. Today, we have established our reputation for developing solutions that enable ophthalmologists to achieve breakthrough treatments across a range of pathologies, including glaucoma, diabetic eye disease, secondary cataract, age-related macular degeneration (AMD) and vitreous opacities. Ellex has always been a business that looks to the future. Since our first years, right through to now, we’ve been committed to investing in the ongoing expansion of our ability to meet the needs of the world’s ophthalmologists. We also possess a long-standing commitment to developing our portfolio of technologies and products so that ophthalmologists can turn to Ellex when they want to meet their patients’ needs. With initiatives including the addition of diagnostic ultrasound in 2007 and the integration of iTrack™ minimally invasive glaucoma surgery (MIGS) technology in 2014, we have leveraged our engineering know-how and industry experience to pioneer new technologies and products. We continue to pursue new opportunities to diversify within the ophthalmology space to open up new markets for our business while also providing additional capacity for our existing product portfolio. Even from our earliest days, Ellex has had an international outlook, and our recent investments in our global infrastructure mean we now possess a truly global business — evidenced by our sales and service subsidiaries in California and Minnesota, Japan, France, Germany and Australia. Our network of more than 50 distributors in over 100 countries means that we possess a robust route to market. It’s a strength that enables us to equip ophthalmologists with our proprietary technologies around the world. Our global distribution channel, matched to our investment in and development of our capabilities in engineering, manufacturing, clinical education and marketing, means we're able to offer new technologies and new solutions to the ophthalmic profession — effectively and efficiently. 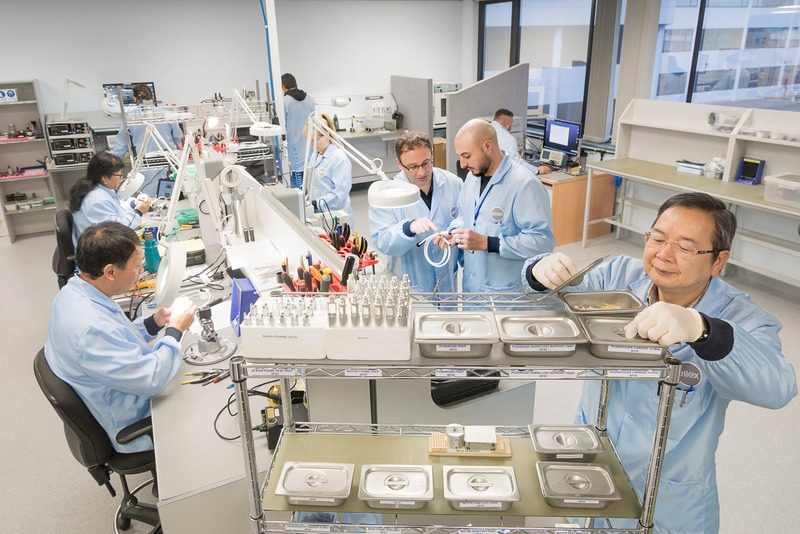 Operated by our team of specialist opto-electronics technicians, our Adelaide manufacturing plant is fully equipped with state-of-the-art production facilities. Our dedication to every aspect of production, including the design and manufacture of our proprietary laser cavities, means that the Ellex name is synonymous with excellence in technology and in high quality. In 2017, we relocated our corporate headquarters to purpose-built facilities in Mawson Lakes, Adelaide, to accommodate ongoing growth in the manufacture of our ophthalmic technologies and products. Ellex's US sales and service support hub for our laser and ultrasound portfolio is managed from our base in Minneapolis, which was established in 1995. It's the home of our national network of sales managers and service personnel, and it's managed by our group of seasoned industry professionals. US sales, service, and manufacturing for our iTrackTM MIGS product are based in Fremont. It's the central point and key driver of our iTrackTM MIGS clinical education program and marketing, and it’s led by a dynamic team who interface with key members of the ophthalmic faculty to ensure the relevance of our products and technologies. Our Lyon location was established in 2006 to strengthen support for Ellex’s European distribution network. The Lyon hub has since evolved to become our European headquarters, and now encompasses sales and service. Ellex has strong ties with the ophthalmic community in Europe, and we continue to develop relations with ophthalmologists across the region to develop new ideas that we can then nurture for future innovation. Ellex's sales and service operation in Berlin was established in 2008 to meet the requirements of the ophthalmology community in Germany. Based in Tokyo since 2003, Ellex's sales and service support capability has ensured that we have built a strong presence and a respected brand in the Japanese market by meeting the needs of our customers within the context of the country's regulatory landscape. Today, over 35,000 Ellex ophthalmic laser and ultrasound systems are in use in more than 100 countries around the world, achieving ophthalmic outcomes once never thought possible - safely, effectively, accurately and consistently. Initially with SLT Selective Laser Trabeculoplasty, then through the introduction of iTrack™ — our solution for minimally invasive glaucoma surgery (MIGS) — and more recently with our 2RT® Retinal Rejuvenation Therapy, we’re expanding our focus on the development of restorative, rejuvenative treatment options that work holistically with the body’s natural healing ability.